Handmade by Charlotte Guptill in Maine. Pendant: 1" dia; Chain: 18"
Because of the custom nature of this item, all sales are final. This necklace was an awesome birthday gift for a friend. I received proofs quickly and the artist was easy to work with. I wanted to thank the artists and Uncommon Goods for the fast response and remaking of the necklace that had been a birthday gift to me from my sister. The map is much clearer and easier to read, and I now have a new chain. This necklace was a gift from my sister for my birthday. 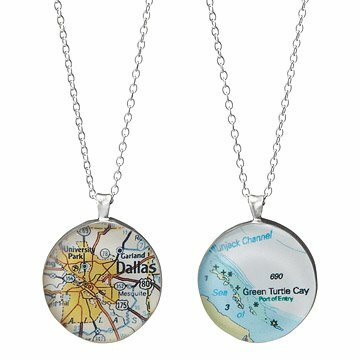 The mapped area in the necklace is difficult to read. Additionally after one wear out to my birthday dinner, the tiny clasp on the unsubstantial chain broke off when removing for the night and was not to be found. Latitude Longitude Pendant through Uncommon Goods, also a gift from my best ever sister, was not as "fragile". Perfect size and length. Something great about this piece is that you can easily layer it with other smaller/shorter necklaces. This is a very meaningful piece of jewelry for me........ the jewel shows the location where my husband and I were married. I was delighted with this purchase. This could be worn with a dress or tshirt and jeans. Other than the print being a little small to see all the details I wanted to see, the pendant itself is a wonderful gift to give. Especially if you're picking a geographic area of sentimental considerations like mine, where the display showed where we spent our first date, the location where I proposed to her, and where we bought our first house (along with other points of interest significant to her youth). I had the back engraved to say "where is all began" with the map of the town we met in. I got it for her just because I felt like she'd love it and being that I work in the field of geography it added just a little more meaning. She wears it with everything. It looks great with a dress or even just a nice shirt. Love my map pendant. The island of Cozumel means so much to me. I love wearing my little island around my neck. The workmanship is wonderful. The pendant is heavy, suggesting durability. The map is a good size for recognizing the locale. The chain measures 18 inches, but perhaps an option for a longer chain could be available. The pendant is simple but beautiful and heavy which tells me that it's durable. However, the chain is too short. I'll need to purchase a separate chain for my wife's comfort. That's not cool. Hopefully the artist will read this and provide longer chains in the future. I would still recommend this product, but the buyer should read this too.